While Jarvis Landry has more PPR value, he doesn’t score and doesn’t typically receive passes more than 15 yards down field. This is where Rishard Matthews fills in. 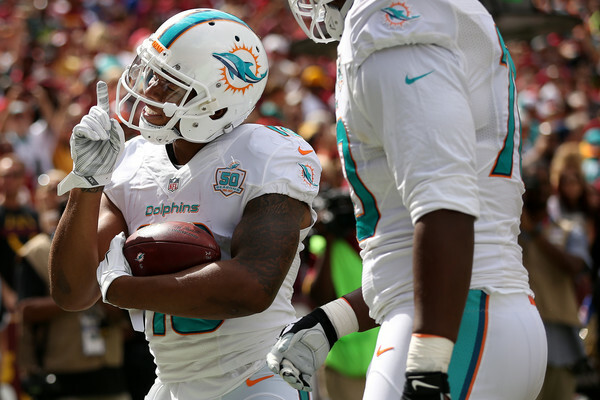 Rishard Matthews is Tannehill’s deep and scoring threat, racking up 262 yards through the air and scoring 3 times so far this season. Matthews averages ~14 standard points per game and it does not seem to be slowing down any time soon. I recommend grabbing Matthews, especially if you are in need of a WR2 or Flex play option. While Taylor may not be the best QB in the league, so far this season he has shown he has fantasy value. Taylor has scored 15, 26, and 24 points respectively. Taylor has made his mark through the air as well as with his feet, proving he has some fantasy value. Now, while he might not be your QB1 he can certainly fill in for those in 2 QB leagues or those in need of a bridge player due to injury or a bye week. The Oakland Raiders!? Yes, the Oakland Raiders. Carr is on a Raiders team that is actually better than previous seasons, and it shows. Wideouts Amari Cooper, Michael Crabtree, and running back Latavius Murray present Carr with actual options; evident with his back to back 300+ yard performances. The Raiders still have a shaky defense which means Carr and company will have to throw the ball more often, meaning more fantasy potential for the young QB. Not to mention he plays Chicago this week and they are just terrible. Marshawn Lynch is 50/50 for this week’s game; if he suits up he will be the starter. If he doesn’t play this week it has been announced Rawls will play in his absence. The rookie ran for 104 yards on 16 carries against a putrid bears defense, now I am not expecting that same production going forward, but he should be able to handle the suspect Lions defense. If you are looking for a fill-in-the-gap player to fill in for the week I would consider Rawls IF Lynch cannot play. Yes, Andy Dalton. Dalton is the #3 fantasy QB (ESPN) yet he is only owned in 59% of leagues. Dalton has passed for 866 yards and has 8 TDs to his 1 INT. I don’t think he can keep scoring at this clip, after all he is Andy Dalton, but I think he can be more than serviceable, especially if your team is suffering from the Ben Roethlisberger injury. This week he plays a Chiefs D that was Swiss cheese for Rodgers, allowed Manning to have his comeback game, and had Hoyer/Mallett pass for 334 yards and 2 TDs. Now Dalton is no Manning/Rodgers, but he is above and beyond what Hoyer/Mallett are as a QB.